What Is Horizontal Directional Drilling, or How Do You Run a Pipeline Underneath a River? Bayous, not quite swamps and not quite forests, are a unique feature of the landscape of southern Louisiana. In the bayous, small channels of shallow, slow-moving water separate patches of marshy ground where trees and plants grow either in the water or just at its edge. Given the soft soil, the area may seem like an odd place for pipelines, yet signs in the Atchafalaya Basin show that the area is crisscrossed by many different lines carrying crude oil and natural gas. Here, a technique called horizontal directional drilling becomes especially useful for pipeline constructors like Energy Transfer Partners. Using horizontal directional drilling, a pipeline can pass under a body of water or another obstruction without requiring that a traditional trench be dug or pipe buried, the company told InsideSources. Drilling rigs are built on movable chassis. Their size depends on the diameter of the pipe that will be used for the final project. They are often controlled from a booth next to the rig and can be moved from job site to job site. The process begins with the drilling of a pilot hole from one surface point to the other. Guided by a surveying system, a rotating drill head is passed through the entire length of the crossing. Although it stretches the entire span, this hole is smaller than the desired pipeline width. After this initial hole is bored, crews remove the surveying system and drill bit from the machine and run several “reaming passes” to make the opening wider. As the hole is bored, the “fisherman” feeds a steel drill string behind the drill head. The string is used to monitor the progress of the reamer. To do so, a device called a reamer is attached to a drill string running through the entire length of the tunnel. On the other side of the road, stream, or other obstacle, a second rig is present to receive the reamer as it passes through. A steel drill string helps workers on each side monitor the location of the reamer. To prevent the newly excavated area from collapsing and filling with soil it is pumped full of drilling fluid. Although it is called drilling fluid, the liquid is a mixture of water and bentonite. The clay gives the fluid enough viscosity to carry soil and debris back to the surface. This fluid passes through long sections of drill pipe into the drilling area. 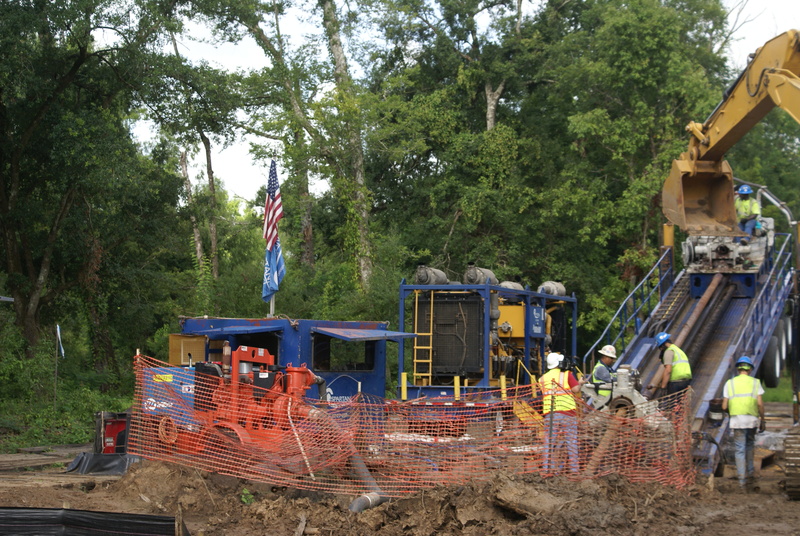 Workers attach sections of pipe at a horizontal directional drilling site. The reaming process occurs in several passes, each using drill pipes slightly larger than the previous. The final hole is between 30 and 50 percent larger in diameter than the final pipeline diameter. After the reamer has passed through completely, crews will often run a final pass with more mud to ensure that the opening is clear of all debris. Finally, the reamer is removed and the pipe is slowly pulled into the reamed hole. This itself is a delicate undertaking, as sections of pipe can easily be 33 feet long and nearly four feet in diameter. Experts in the energy industry explain the end result is a minimally invasive road or waterway crossing, with no need for trenching or backfill. A cleared pipeline route where HDD has been used.